Good morning fellow crafters. 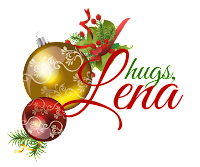 It's Lena here today, sharing another Christmas in August project. I'm slowly, slowly building up my Christmas card stash to avoid a mad rush in November :-) So without further ado, let me show you my card. Here is a quick pictorial of how I made this card. I used a circle die from Spellbinders to cut out the portion of the image I wanted to use on my card. 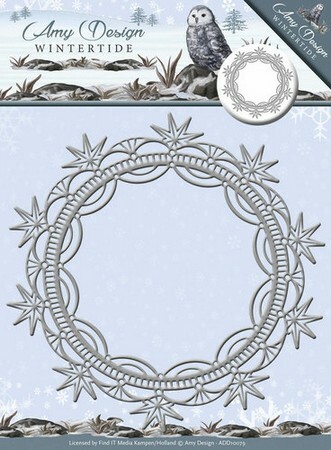 As you can see I had to take a pair of scissors and cut a sliver around the circle so that it would fit nicely behind the Ice Crystal frame I used from Amy Designs. Next I cut the Santa's Sleigh & Reindeer by Cheery Lynn Designs and using foam tape to give it a little dimension, I adhered it to the top of my card. 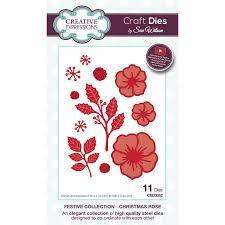 For the floral accent at the bottom, I cut and embossed three holly branches from the Sue Wilson's Christmas Rose die and stamp set. I used another 3rd holly branch on the inside of my card to bring it all together. I hope I was able to inspire you to use your dies to recycle some old Christmas cards you have or those that you receive from the various organizations. 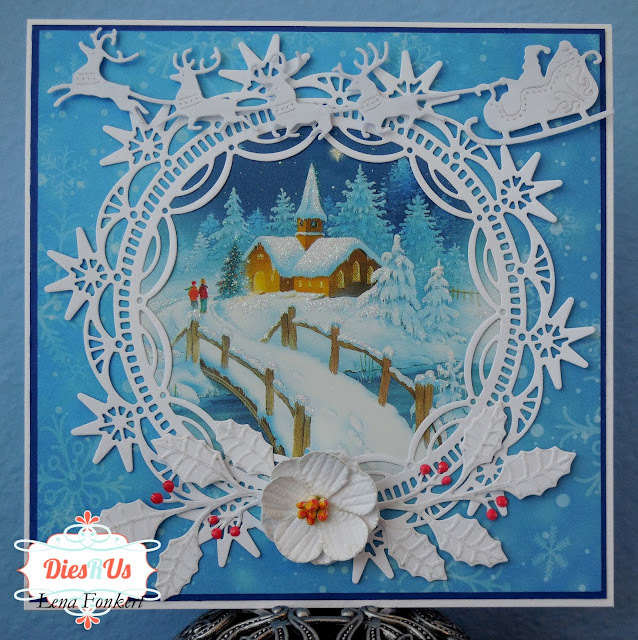 All you need to do now, is to create a project and come play along at the Dies R Us Challenge Blog for your chance to win a gift voucher to the Dies R Us Store. A new challenge begins on the first and fifteenth of every month. Be sure to Follow Us on Facebook too. Oh my goodness Lena, this is absolutely stunning and pure genius! I love that ice crystal die so much I went right over to DRU and added it to my wish list. What a great way to recycle old cards. Thanks for the inspiration! WOW What a great recycling idea (I have tons of those cards which I usually try to give away ... but might run through them again before doing so now! 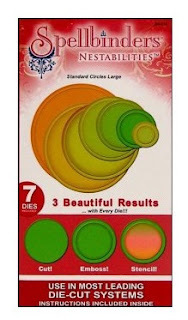 lol) Absolutely BEAUTIFUL design and wonderful inspiration! Thanks so much ... great job! Great idea to recycle some Christmas cards and make them gorgeous! Stunning card ! Love this idea ! amazing! I love the idea of recycled cards! I new there was a reason I kept them, lol!